I saw this idea on 521 Lake Street blog as a Halloween craft. The craft is a hard cover book of about 200 pages or less that has been folded top to center and bottom to center to make a pocket. Then the inside covers of the book are decorated and tags are placed in the pockets. It can be placed on an easel for better display. 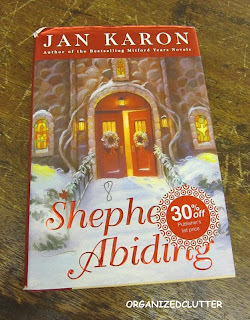 I found this book "Shepherd's Abiding" for 50 cents at a consignment shop. My book had about 280 pages so I ripped out a few here and there (not all in one spot) to make about 200 pages. I used a little Distress Ink to age the edges of the pages a bit. Then I measured, cut and mod podged some scrapbooking Christmas patterned paper on the inside covers of the book. I also purchased some vintage look scrapbooking stickers. I added the stickers and some buttons to the inside book covers. Then of course I made a few tags of varying size and decoration and ribbon or twine. It wasn't too hard or too expensive (under $10), and it was a lot of fun. 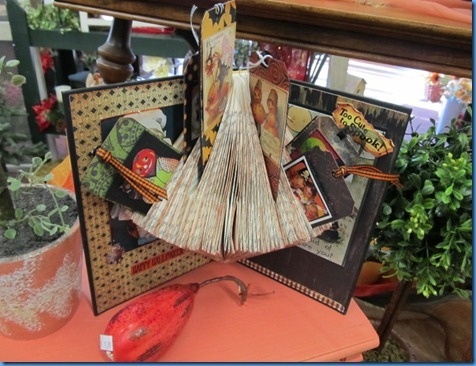 If you enjoy scrapbooking, you will love this! It's super cute! It's too bad you can't see the title of the book when it's in the stand. Then again...too bad you couldn't have had time to read the book before crafting with it! It's a great Christmas story, I've read it several times! that is so clever!! I love this idea, I think I'm your newest follower! Carlene this is super! Looks so pretty. You are getting so crafty there girl. Thanks for sharing. That's so sweet and festive theme crafts. Loving it. visiting from Marty's TTT party. wow you are so creative. I love your unique take on folded book paper. Just adorable - thanks for sharing. I am a new follower and I found you over at Kim's! Still catching up from my 11 day hiatus! 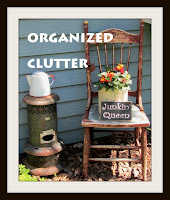 This is one beautiful project and I pinned it! It's just one of those things that you can't stop looking at! Now to find some cool stickers....scrapbookers have the best stuff!! Great job girl! So, so cute Carlene! I have some cute scrapbook papers and fun stickers. All I would need is the book. The question is, will I have the time? Yous turned out so cute! Thanks for sharing with Share Your Cup. Love it! I wonder if you could use it for Chirstmas cards too...a Chirstmas card holder? I love the Halloween one and yours too! That is so cute and simple! That might work to hold Christmas!